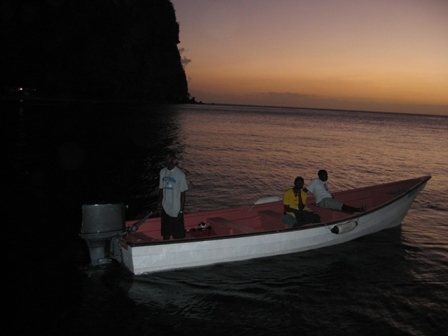 After saying goodbye to our new friends on Bequia we headed for the amazing island of St. Lucia (Loo-sha). 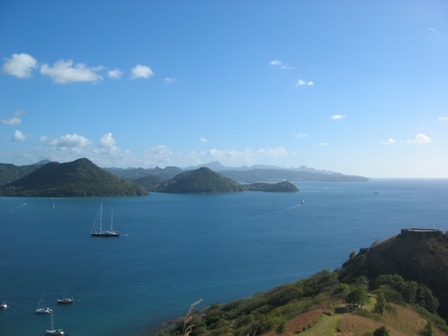 St. Lucia was discovered during Columbus' fourth voyage in 1502. 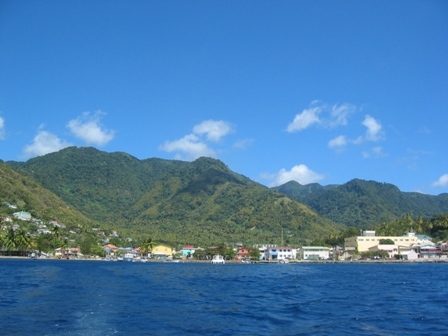 Lying between Martinique to the north and St. Vincent in the south, made St. Lucia a treasure to own for its strategic position and was caught in a power struggle between the British and French for hundreds of years. Finally on February 22nd, 1979 it became independent. 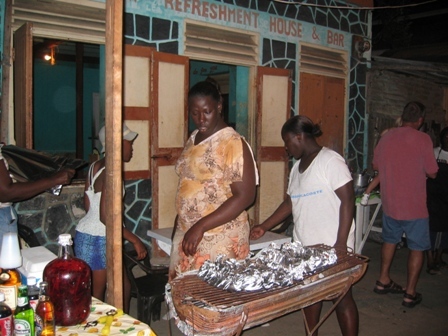 The primary languages spoken here are English and a French based patois. The currency here is also the EC$. Agriculture is one of the islands most important source of revenue now, where bananas, cocoa, coconuts and citrus fruits are the major exports. Tourism is also an important income source. It is easy to see why with this tropical island indented with sandy coves, crystal clear waters and stunning volcanic mountains draws so many visitors to its shores each year. St. Lucia also has a tenth of the 617 sq. km (238 sq. mile) that consists of a thick carpet of tropical rainforest where the St. Lucia parrot (Amazona vericolor) and pygmy gecko live along with orchids, anthurium and frangipani just grow wild. 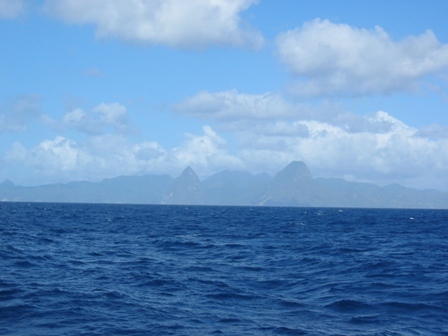 Approaching the southwest coast of St. Lucia with the dark green peaks of Petit Piton 736m (2,414 ft.), on the left, and Gros Piton 795 meters (2,600 ft.) creating a magnificent sight to see from Dalliance. 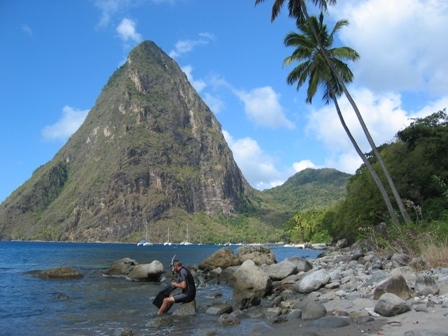 One of the most spectacular features of St. Lucia are the Pitons. 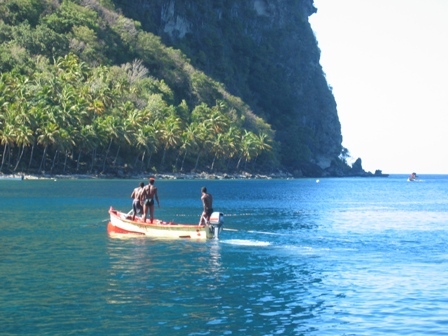 These two majestic, sharp peaks located on the southwest coast have become the symbol of the West Indies. 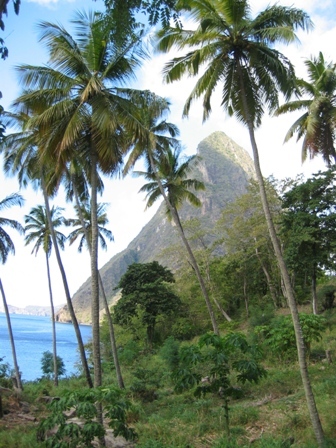 The Pitons rise straight out of the Caribbean Sea to a height of 795 meters (2,600 ft.). 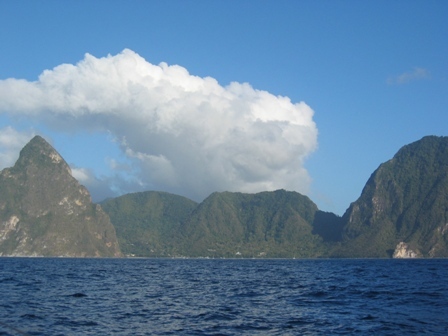 These two peaks are proof that St. Lucia is actually a pile of lava that came out of the sea millions of years ago after a series of enormous eruptions. The volcanic nature of the island is also the reasons that there are so many different shades of sandy beaches, from snow-white to black, on this dramatic coastline. I am looking forward to collecting some samples of the sand for my collection. By the way, it is really coming along. It is getting so large in fact, that we are considering moving my collection to the bilge for ballast. 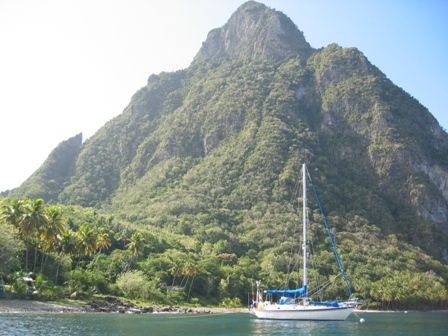 We were able to get an amazing mooring at the base of the Pitons in crystal clear water. 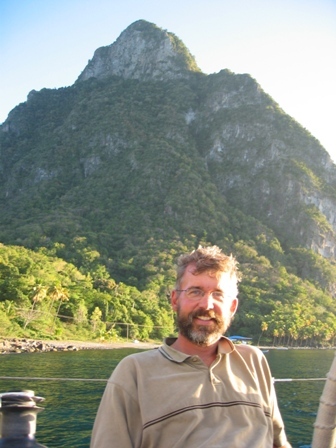 This is Petit Piton behind Marco. After getting all settled we headed over to our friends on Cinnabar, Ed and Julie, to have a few drinks. While chatting away I was telling Julie how I noticed that our bilge was smelling pretty bad and that it was time to clean it again. A little while later I was noticing the same "aroma" coming from Ed and Julie's boat. It took me a little while longer, when we were again on Dalliance, having opened all the hatches and portholes to air her, out that I figured out what I was smelling was not our bilge but the smell of hydrogen sulfide, a smell similar to bad eggs, coming from the crater that is not too far from where we were moored. What an amazing place to have to ourselves!! 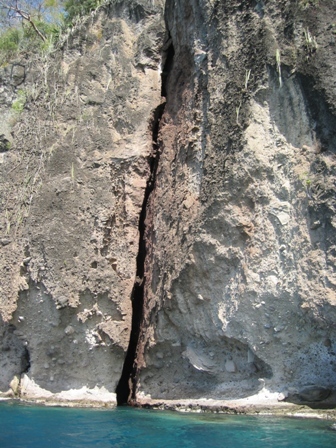 Just outside the town of Soufriere in the bay there is a large fissure in the rocks known as the bat cave. Even during the day you can see the wall covered with a mass of squirming and fluttering bats. I think my mom was glad she missed out on this part of the trip!!! Sometimes it is difficult to decide if the scenery is nicer above or below the water line. We ended doing a great deal of snorkeling around the Pitons. One morning we were looking around and I noticed on my right had side 5 barracuda's, and I was convinced that they were looking at my white fins. Well, I have to admit I swam pretty fast past them and got off at the beach, "to rest". Meanwhile Marco had seen them and me swimming very fast that he couldn't resit poking fun at me. Heck I deserved it, for years I have laughed about Marco swimming really fast back to Dalliance in Newport after he thought of sharks. It is interesting though that barracuda rarely bother the diver or snorkeler but all shiny things should be removed before getting into the water. They seem to like BLING as much as every other girl. 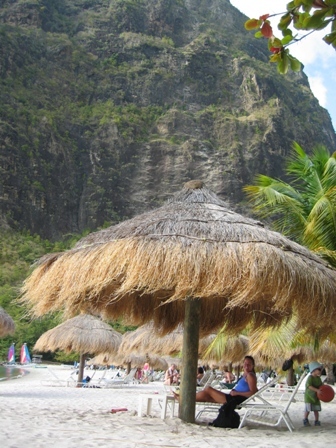 Holly is enjoying some shade at the Jalousie Resort in the Pitons. There was no shortage of vendors peddling (paddling?) their wares. Without exception, they were all courteous and polite, dispelling some of the stereotypes. Here Pascal displays some of his carved calabash gourds. We do have to work on Holly's negotiating skills however. 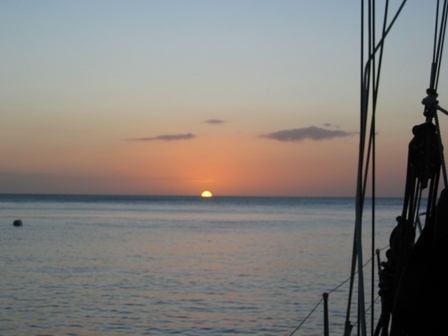 Sunset at the mooring brings another chance to see the elusive green flash. 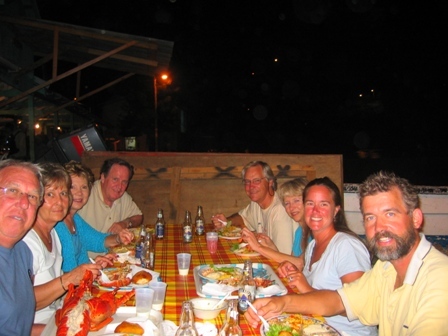 Our neighbors Chuck and Fran on Andiamo invited us on a night outing to a block party in Anse La Raye, which was about eight miles north. Every Friday night the town blocks off the major road and people set up BBQ's, bars, music systems with enormous speakers where everyone eats and has a great time. They call this Friday Night Street Jump. Benny junior from the Harmony Beach Restaurant brought us with his fast boat, and even posted a security person to keep an eye on our boats while we were away from them. 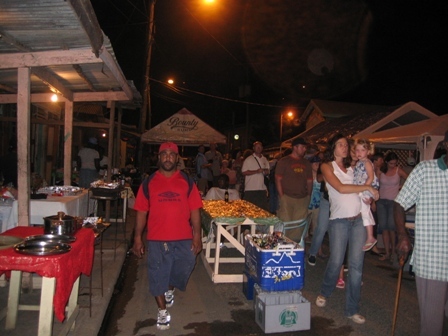 The entire waterfront street in Anse La Raye became one large party. 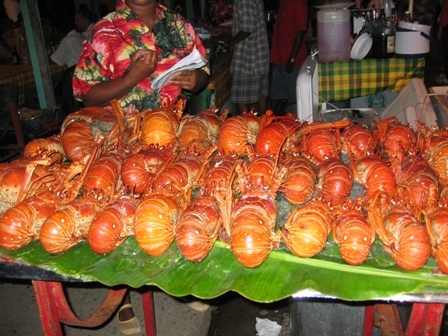 Local lobsters were also on the "menu". The various foods sold at little stands were amazing. We even sampled some conch stew. Great dinner with our neighbors and their friends. Early in the morning the locals would fish for ballyhoo with a large drift net to encircle a school. They primarily use the ballyhoo for bait fish to catch larger fish. 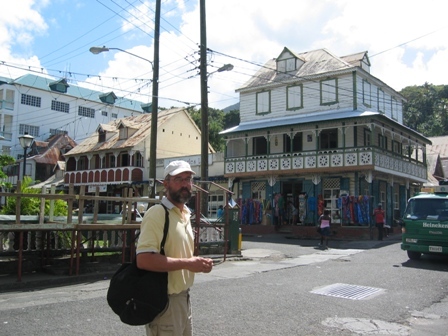 This is the town that was in the bay where we picked up the mooring under the Pitons. Old wooden building line the streets with a dark sand beach on the bay. 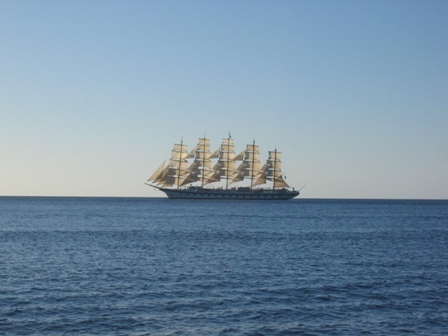 Clipper Ship under full sail while we are sitting on our mooring in Soufriére Bay. 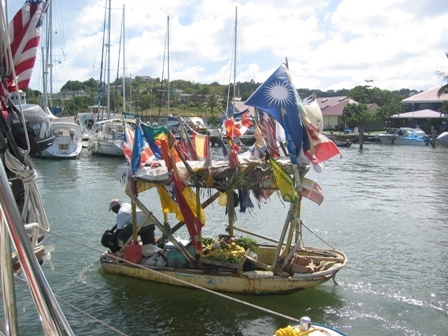 After only 3 nights it was time to head up north to Gros Islet, Rodney Bay. Here we met back up with Lena, Ylva and Jonas, and Ed and Julie also were there. 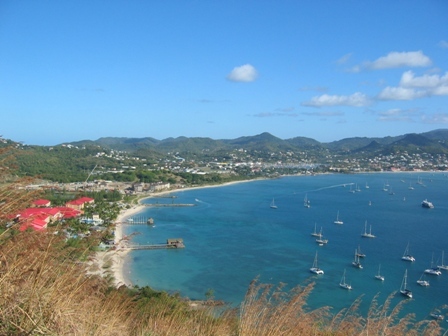 Rodney Bay is where all of the sailors that crossed with the ARC arrive and has room for 1,000 yachts. Rodney Bay was actually built as a US Navel Base initially used to protect the Panama Canal. 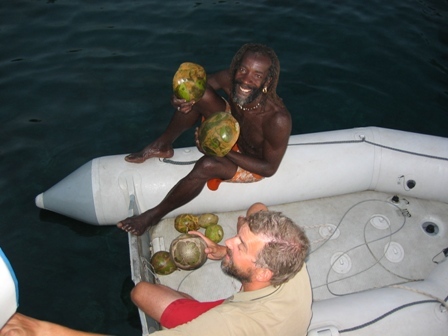 Here we did a few boat projects, Marco treated himself to the much deserved massage and we relaxed. It was nice to be at a dock, the first time since we left Gran Canaria on December 5th. 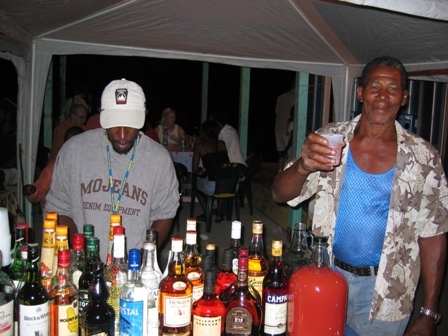 The vegetable man in Rodney Bay. Looking south towards the Pitons from Pigeon Island National Park, a minute island that is linked to the mainland in Rodney Bay. Here Marco and I took a walk its steep paths with tropical vegetation all around us. 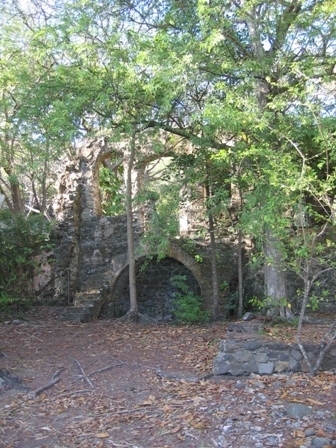 Throughout the island are remnants of Fort Rodney that was occupied by the British so that they could keep and eye on the French Navy that was stationed on nearby Martinique. Anchoring in Rodney Bay seen from Pigeon Island National Park. These are remnants or Admiral Rodney's Quarters that were built in 1782, then rebuilt in 1824. Admiral Rodney never slept here however, it was said that he preferred to stay in the harbor on his flagship, "in comfort". The most intensive period of British occupation on Pigeon Island was from 1779 to 1783. 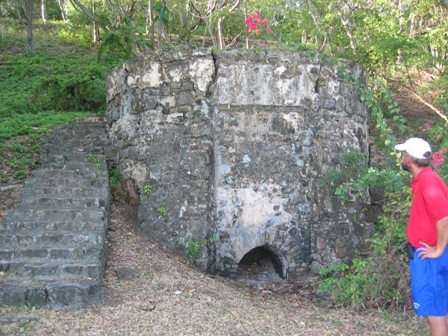 This lime kiln was one of the first structures built on the island. Lime was used as a binding agent for all masonry work. White lime was made from coral and shells which were piled up and set on fire. The lime turned to a powder and then mixed with the ash. The mixture was then pulled out with a hoe, and mixed with sand, water, egg and straw to form the binding agent used in masonry work.